Before lunch, I thought the only spooky thing about Fridays before a holiday (4 days off! Yes!!) was the rampant productivity. I was getting in a groove at work, people decked out in red and green finery, and treats were abundant at the water cooler. No senioritis here today. Eventually, another blond Russian miss came in to take my order of potato pie (potatoes, onions, mushrooms and a light sour cream sauce in a latticed golden crust). She served it cold; the ovens were turned off. Only coffee was available. “You must have your hands full with all the orders,” I commented, gesturing towards the boxes. “Yes…but it’s bad when a lot of people got laid off before finishing them…” she answered, shrugging. Oh, my. This is rough. My heart fell out of my chest; I had no idea what to say next. For now, I can still provide a sale for the others who were left still working. I hope the others will be okay this holiday season. 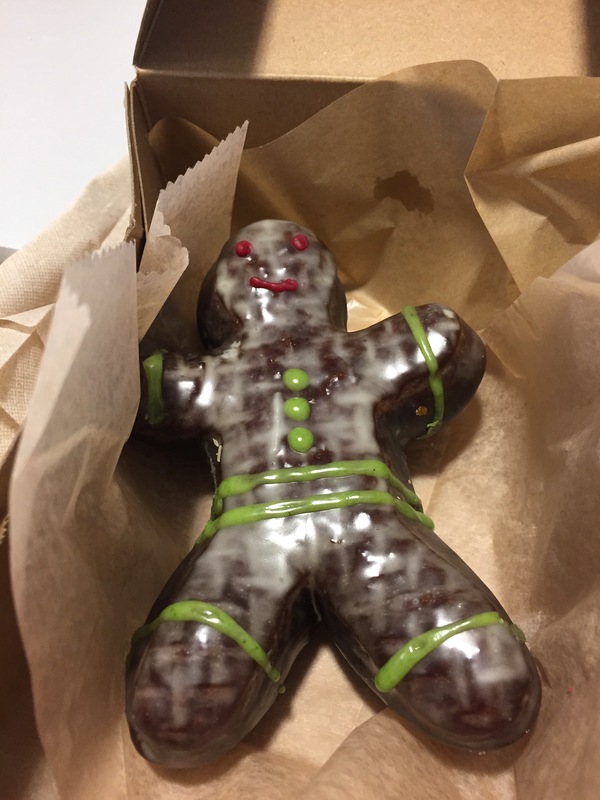 Meanwhile, I ordered the Gingerbread Man Doughnut, because in my mind, all forms of gingerbread are holy items. It was very delicious!